Physician owned distributorships (PODs) have been the source of considerable controversy for years. A couple years ago, they caught the attention of Congress. Now, the Office of Inspector General of the Department of Health and Human Services (“OIG”) has issued a Fraud Alert making clear their dislike of PODs and sending a clear shot across the bow of those who are in that industry. DME Leads: When is a Lead a Referral? By: David W. Hirshfeld, Esq. 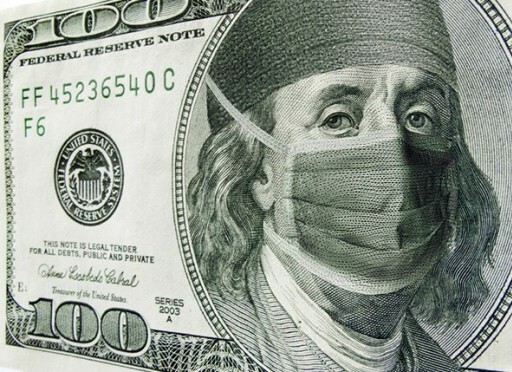 The Federal anti-kickback statute provides that it is a felony for a person or entity to knowingly and willfully offer or pay any remuneration to induce a person to refer an individual for the furnishing or arranging for the furnishing of any item for which payment may be made under a Federal health care program, or the purchase or lease or the recommendation of the purchase or lease of any item for which payment may be made under a Federal health care program. Florida’s corollary to this Federal law is the Florida Patient Brokering Act, but the Florida statute applies to all health care services, regardless of whether paid for by a Federal program. The Federal law creates criminal liability, and includes a knowledge requirement. Congress recognized that business models exist that may appear as willfully paying remuneration in exchange for a referral, but which have more innocent motivations, and are less likely to result in abuse to the health care program at issue. In order to give the health care industry a measure of comfort, Congress created several “safe harbors.” If a business model fits within a safe harbor, then it is deemed to not be an illegal kickback under Federal and Florida law. The Department of Health and Human Services Office of the Inspector General (“OIG”) is the agency charged with enforcing the Federal anti-kickback statute. In November 2008 the OIG considered a situation in which an advertising company created a website that would give prospective patients contact information for a list of chiropractors in their area, in response to a zip code entered by the prospect. The prospect paid nothing for the service, but the chiropractors paid the advertiser a fee for each call or contact from the website that lasted over thirty seconds, regardless of whether the contact resulted in a prospect becoming a patient. This scenario is as close as the OIG has come to opining on a typical DME lead generation. The OIG found that the chiropractors’ advertising service was not a prohibited kickback, and cited four factors as convincing: (i) the advertising company is not a health care provider or supplier, and is only affiliated with the health care industry through the arrangement at issue; (ii) the advertising program did not target Federal health care program beneficiaries; (iii) the fees paid by the health care practitioners did not depend upon whether the prospect actually became a patient; and (iv) the advertising program did not steer patients to a particular chiropractor. When applied to the DME context, the OIG opinion and the anti-kickback statutes suggest that leads can be sold for a per-lead fee as long as the leads are not priced, and do not contain information so detailed, such that the purchaser can cherry-pick those leads it wants to purchase based on the likelihood that the lead will result in an actual sale of covered DME. For example, a “raw” lead comprised simply of a prospect’s name, contact information, and interest in speaking with a DME supplier is probably the sort of lead that could be sold for a per-lead fee without running afoul of the anti-kickback prohibitions. As more and more information is added to the lead, such as the type of DME products of interest to the prospect, information regarding the prospect’s insurer and plan coverage, the purchaser will be better able to determine whether the lead is likely to result in a sale of DME (a “qualified” lead). At a certain level of detail, a lead morphs from lead that can be sold on a per-lead basis, to a referral that cannot. A lead generation company can sell highly detailed qualified leads if that sales relationship fits within the safe harbor for “Personal Services and Management Contracts.” That safe harbor requires that: (a) the aggregate compensation to be paid under the contract must be fixed in advance; (b) the compensation must be consistent with fair market value in an arm’s-length transaction; and (c) the compensation must not be determined in a manner that takes into account the volume or value of any referrals or business otherwise generated between the parties for which payment may be made by a Federal health care program. The requirement that the compensation be fixed in advance does not tolerate a per-lead fee. Fixed in advance would be a weekly, hourly, annual fee. This article focuses on anti-kickback liability associated with DME leads, but there is also liability attached to how the lead is originated, and how the prospect is contacted. Lead generation companies are often well-served by committing their relationships to written agreements with advice from appropriate counsel. Followers & Friends – BIG Announcement coming out today! If you haven’t seen our new NATIONAL platform, check it out here at http://www.nationalhealthcarelawfirm.com and stay tuned for our #healthcare #legal news at 2pm EST !!! 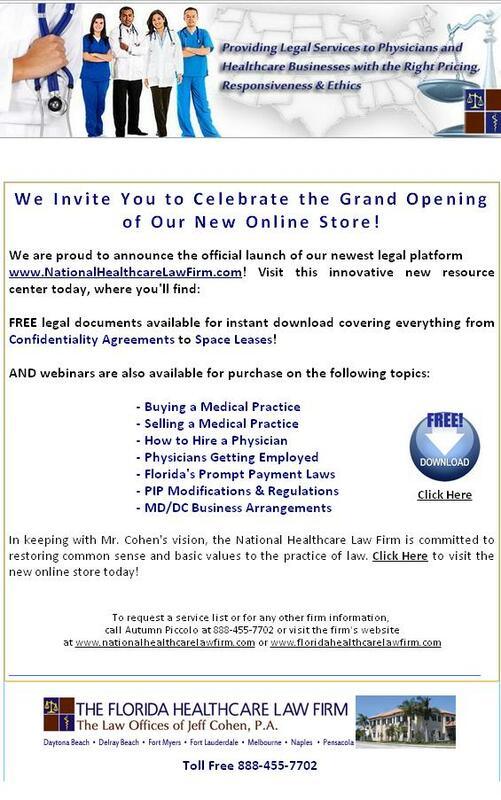 (Delray Beach, FL) June 21st, 2012 – The Florida Healthcare Law Firm, one of Florida’s leading healthcare law firms, today announced a major increase in their legal practice capabilities with the official launch of the National Healthcare Law Firm, a d/b/a and new portal of the firm. The expansion to a national platform providing healthcare legal services to physicians and healthcare businesses is one that significantly increases resources for clients who lack qualified local healthcare counsel. While the Florida Healthcare Law Firm has for years assisted clients outside the state of Florida*, this new development further cements the firm’s commitment to providing ethical legal counsel in the healthcare industry. “We are very excited about it. The fact that we serve clients all over the country has been a small secret for a while but we realized there’s a huge demand and decided to just go for it,” said Jeffrey L. Cohen, Esq. Founder and President of Florida Healthcare Law Firm. Acknowledged throughout the country for its service and excellence, Florida Healthcare Law Firm is one of the nation’s leading providers of healthcare legal services. Founded by Jeffrey L. Cohen, Esq and headquartered in South Florida, FHLF provides legal services to physicians and healthcare businesses with the right pricing responsiveness and ethics. From healthcare clinic regulation, home health agency representation and physician contracting to medical practice formation/representation and federal and state compliance matters, the Florida Healthcare Law Firm is committed to bringing knowledge and experience to a diverse group of clients. Investigations and successful prosecutions for violation of laws like the Anti Kickback Statute (“AKS”), the Stark Law and the False Claims Act were dramatically up in 2011 and are expected to climb still higher in 2012. For instance 13 doctors were charged in December, 2011 with violating the AKS by receiving payment for referring patients to an MRI center. Physicians and other healthcare business people MUST have any suspect arrangement closely scrutinized by highly qualified counsel. A “suspect arrangement” is any arrangement between providers of healthcare services that involve, to any degree, the exchange or payment of anything of value, including money. The AKS is a criminal statute; and the risks of enforcement are now huge. Business and arrangements which are designed at all to lock in physician referrals carry particularly large risks and require close scrutiny. For instance, surgery centers that received referrals from non-owner physicians viewed that as a great thing. Now, referrals from unaffiliated physicians are viewed as inherently suspect. “What,” the regulator thinks, “is driving this referral? What wrongful conduct is being engaged in here?” This is especially so with any marketing arrangement as well. Physicians and other healthcare business people would do well to recall that if even “one purpose” of the arrangement is to compensate (cash or anything of value) someone for a patient referral, the AKS is triggered. Moreover, where Safe Harbor Act compliance was recommended, many now find it necessary.